Here's something that caught my attention in the news yesterday. A lone gray whale was spotted wandering around in the Mediterranean--the first of its kind to be seen in the Atlantic Ocean in at least two centuries. Gray whales are known for migrating enormous distances; they travel about 5,000 miles south at the start of every winter. Even so, this guy would have had to set some kind of distance record. The other, even less plausible possibility is that a population of gray whales has been in the Atlantic all along, remaining totally hidden. If you're interested, here's a BBC article where they note that gray whale is "also spelt grey." The whale in the picture is, of course, not a gray or grey whale. 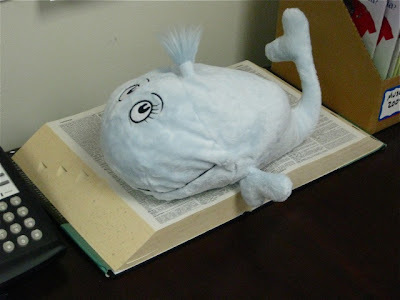 It's a sky-blue, plush Dr. Seuss whale that I named Geisel (after Dr. Seuss's real name, Theodore Geisel). My grandparents, after reading an article I wrote for my magazine called "How to Mail a Whale," mailed it to me. For now, Geisel is living on top of my Webster's Unabridged. But I haven't ruled out the possibility that he's a migratory species. Why Do Kids Hate Polar Bears?